Visa to Turkmenistan: KoreaKonsult will issue an invitation letter for your tour. In order to obtain the visa you will need to submit the letter to the nearest Embassy of Turkmenistan and get the visa stamped to your passport. If there is no Embassy of Turkmenistan in your country this letter will let you obtain the visa on arrival in the Ashgabat airport. UNIQUE OPPORTUNITY! Join our adventure to the most mysterious and unexplored country of Central Asia - TURKMENISTAN! It is going to be an unforgettable 6 nights /7 days journey, book your seat and join the adventure now! Nowruz is the name of the Iranian New Year, also known as the Persian New Year, which is celebrated in Turkmenistan as well. It has been celebrated for over 3,000 years. 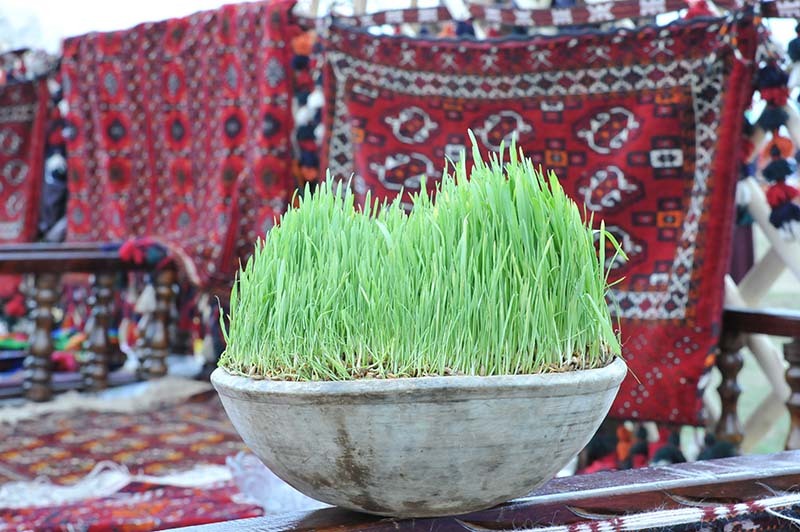 Nowruz is the day of the vernal equinox, and marks the beginning of spring in the Northern Hemisphere. It usually occurs on March 21 or the previous/following day, depending on where it is observed. The moment the sun crosses the celestial equator and equalizes night and day is calculated exactly every year, and families gather together to observe the rituals. Get a peek behind the most closed and the least-visited of Central Asia’s countries Turkmenistan is an ancient land of great spirituality, tradition and natural beauty. The capital city Ashgabat boasts many Guinness World Records such as the world’s largest flagpole; carpet; representation of a star; facility with the greatest number of fountains in a public space; and the biggest number of buildings made out of white marble! The tour itinerary is a PRELIMINARY one. Korea Konsult reserves the right to change some parts of the itinerary below if needed. Eventual itinerary changes after the group arrival in Turkmenistan are beyond our control. Under no circumstances can Korea Konsult be held responsible for any itinerary changes. Free time. You can walk around the hotel; near the hotel, you can visit beautiful monument of Akhalteke horses, park of “Ylham” (Inspiration), “Altyn Asyr” trade market. We will begin our tour in Ashgabat: you will visit Ruhyyet Palace, Wedding Palace, modern “Yildyz” Hotel, Ferries Wheel, Constitution Monument, Arch of Neutrality, Monument and park of Independence, Artogrul Gazy Mosque and other beauty sights of Ashgabat. You will be also taken to grandiose Square of Revival (Galkynysh) - a new administrative, business and cultural center of Ashgabat. Have a stroll along Ylham (Inspiration) Park. 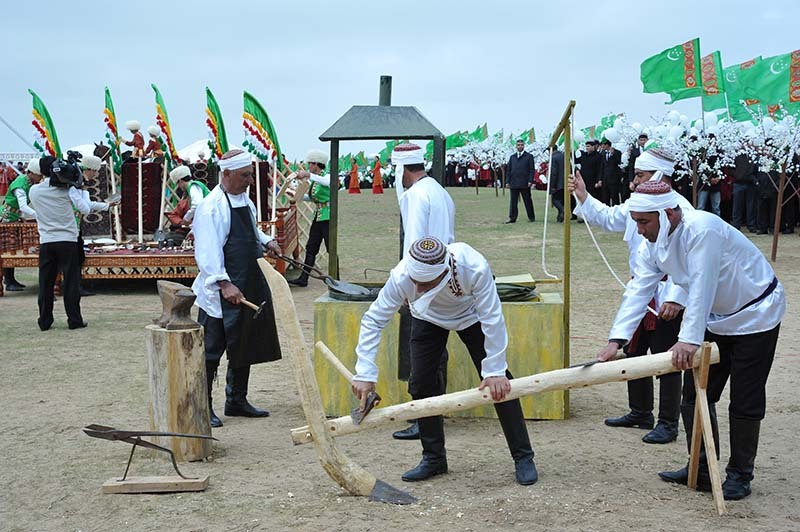 Drive to Turkmen Yayla – participation in Novruz Bayram Celebration. 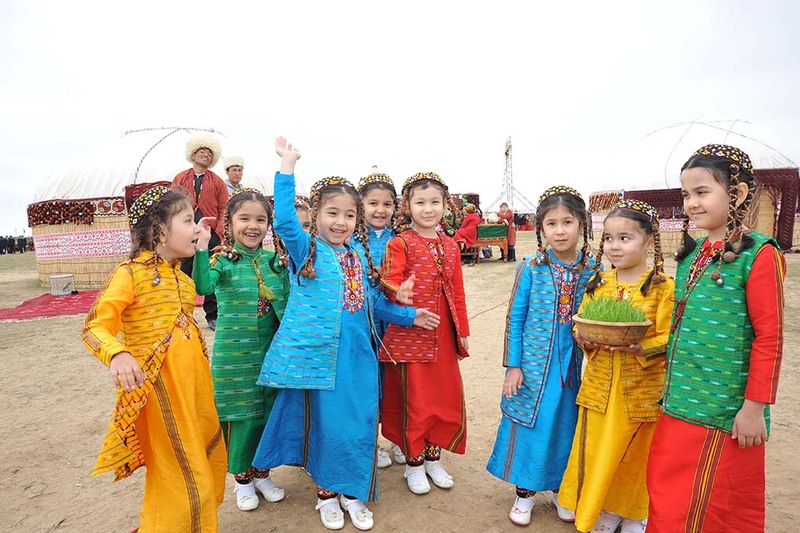 Navruz (also called Noruz, Nowruz, Nowrooz, and Nawruz), the spring "New Year" holiday, has been celebrated for at least 3000 years, and perhaps for as long as 5,000 years. Originating in Persia and long associated with the ancient Zoroastrian religion, its name means "new day" in Farsi because for ancient Persians it marked the first day of the New Year. On this day, Persian kings would have worn a crown with images of the annual solar cycle on their heads, participated in the divine mass in the Temple of Fire, and distributed generous gifts to citizens. 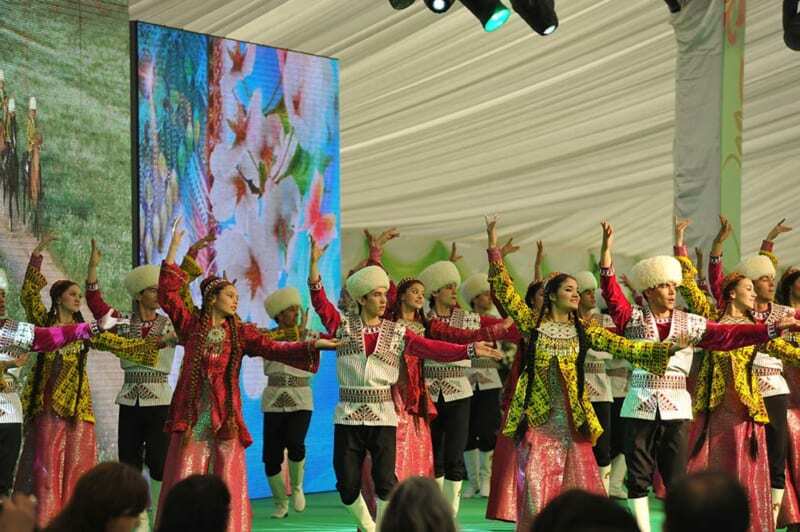 Today, by the scale of festivities organised on governement level Turkmenistan has become the center of celebrations of the International Day of Nowruz. 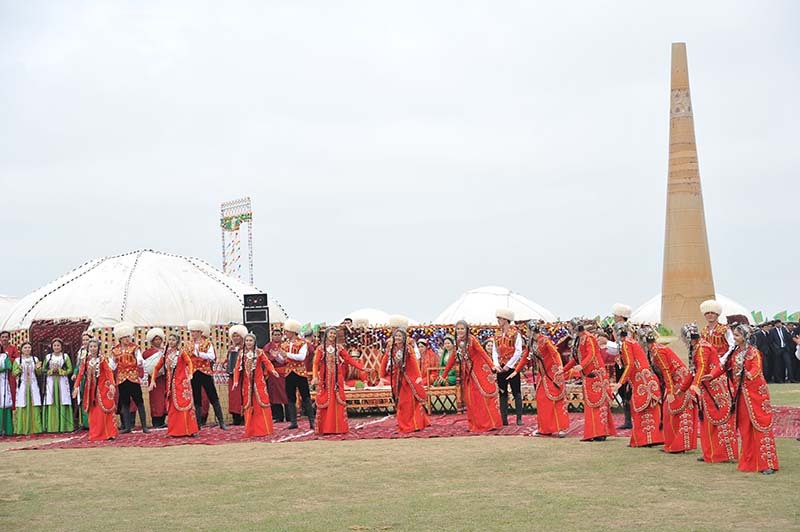 The main festivities in honor of this holiday take place in the sub-mountain valley of Akhal, in the historic land storing the layers of ancient civilizations. According to the centuries-old tradition, a picturesque place in the open air, where the spring expanse best suits the spirit and scale of the long-awaited event, is chosen for the large-scale celebration. 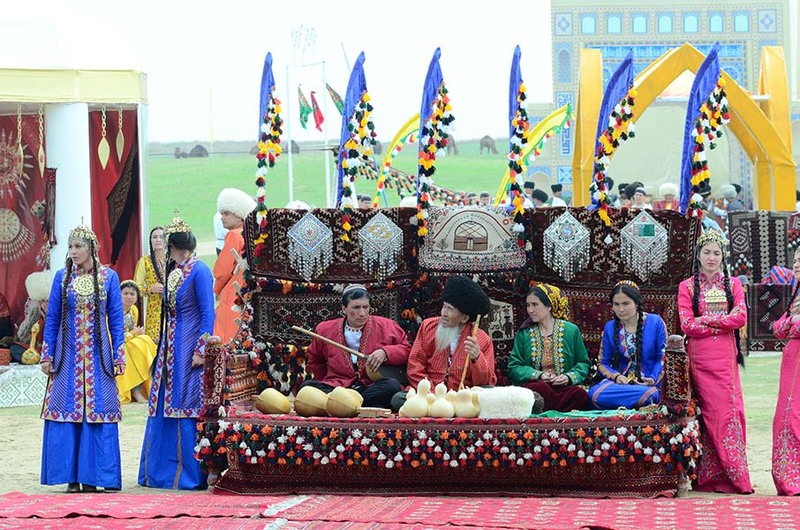 They set up a Turkmen village from the oriental tale, hospitable and welcoming, open to friends and neighbors. Yurts with well-attended courtyards, a high swing and big white yurt stand behind the symbolic gates. Visit folk show, of five regions: Balkan, Ahal, Mary, Lebap and Dashoguz. The first thing the guests will see is a colorful bazaar that spread out just behind the main entrance, where street trading is in full swing. The bazaar offeres the entire range of handicrafts - colorful souvenirs, hats, skullcaps, musical instruments, household items, painted pots, carpets and jewelry, national embroidery. This action is accompanied by ancient melodies and songs performed by Bakhshi (singer-narrator), who attracts emotional listeners. At some distance, Palvans (strong men) wrestle and cheerful national games go on. In the old days, there was a special place for such games in a crowded area. Erected in the festively decorated square, the mock-ups of famous historical monuments of Turkmenistan - Kunyaurgench, Ancient Merv, Dehistan, Anau etc. – strengthened the feeling of an exciting journey into the ancient times. Drive back to Ashgabat. Overnight at Hotel. Transfer to the airport. Flight to Mary. Drive to Bairamali city 35 km from Mary to explore the archaeological and historical jewels of the ancient Silk Road City. Visit ancient Merv – “Queen of the world”, one of the most important capitals of Islam along with Baghdad, Cairo and Damascus. Enjoy ancient Merv: Gyz Gala & Oglan Gala (VI-VII), Complex of Askhabs: Al Hakim Ibn Amr Al Jafari and Buraida Ibn Al Heseib Al Islami (VIII-XIV), Gyaur Gala (IV BC), Soltan Sanjar Mausoleum, Buddist Complex (IV-VI), Beni Makhan Mosque-first Mosque built in Central Asia. Mary city tour: The Central Theatre, The Convention & Conference Center "Ruhiyet Koshgi", Park & Monument of Mollanepes-the National Classic Poet. Drive to Kunya Urgench (UNESCO 2005), ancient capital of Khorezm.